Would you ever think that an 18-year-old would ignore what society considered conventional and pave his own entrepreneurial path? 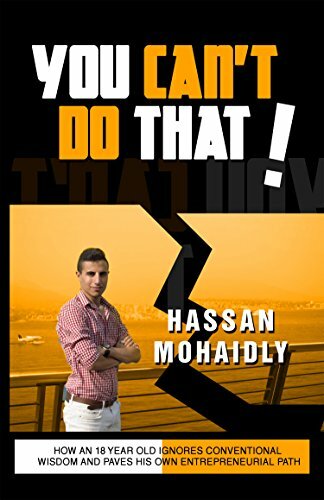 In “You Can’t Do That,” I take you through the journey on how I ignored conventional wisdom. I share with you the 7 valuable lessons I learned from surrounding myself around my mentors on achieving success and living a financially free lifestyle. Some of the really successful mentors I surrounded myself with were Dan Lok, whoâ€™s a multi-millionaire serial entrepreneur, Joo Kim Tiah, whoâ€™s building and financing the $360-million dollar Trump Tower in Vancouver, and Darren Jacklin, whoâ€™s an angel investor and corporate trainer. Additionally, I share with readers why and how I developed this mindset, what the lessons meant to me, and the challenges I faced implementing these new lifestyle changes. The mentors that came into my life made me think differently about achieving success and question conventional thinking and as a result of reading my book, it will do the same to you. I was really fortunate for having the opportunity to surround myself around extremely successful people. The lessons they taught me on achieving success and financial freedom was worth more than a college degree, which is the main reason why I’m sharing these lessons with you. Since those lessons left a lasting impact on me and will benefit me on my road to success and financial freedom, I believe it can with you. The 7 Valuable Lesson’s I Learned From My Successful Mentors Which Include: Why Developing A Deep Driven Desire Is Important To Your Success In Life, The Benefit Of Surrounding Yourself Around Successful People, How To Overcome Criticism And People Misleading You, Why Failures And Making Mistakes Are The Most Valuable Thing You Can Make, And Many More! Why Ignoring Conventional Wisdom Is Vital To Your Success In LifeTake action today and download this book NOW!